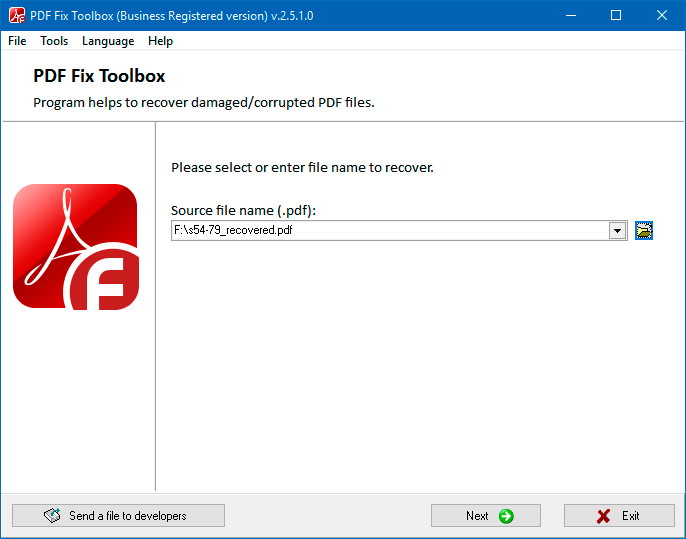 PDF Fix Toolbox recovers damaged Adobe Acrobat documents. The broken pdf file fix program reads a faulty *.pdf file and saves all the recovered information into a new document. Fix damaged *.pdf files of any version and complexity. Special algorithms which guarantee maximum effectiveness. Search and recover unlinked pages in damaged files. Scan pages with links to media objects that are not indicated in the document, whether because it has become corrupted or because they have been deleted from the file. 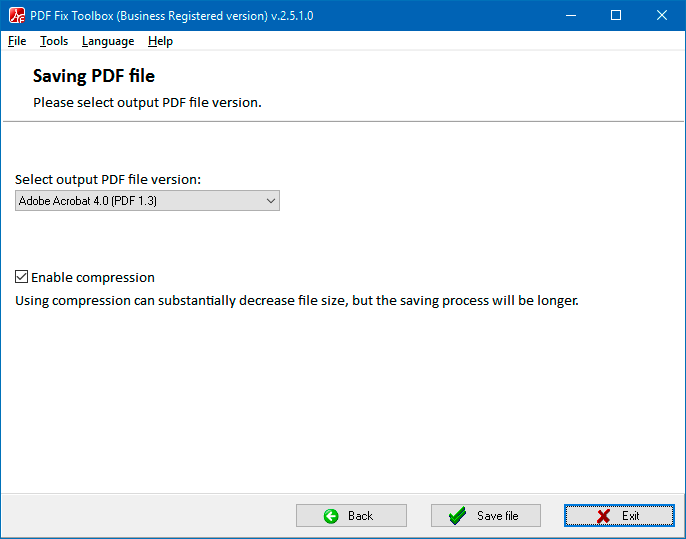 Option to save compressed and non-compressed PDF files. Thanks to its unique algorithms, the adobe pdf fix broken program is able to fix certain errors caused by the incorrect operation of PDF editor programs. 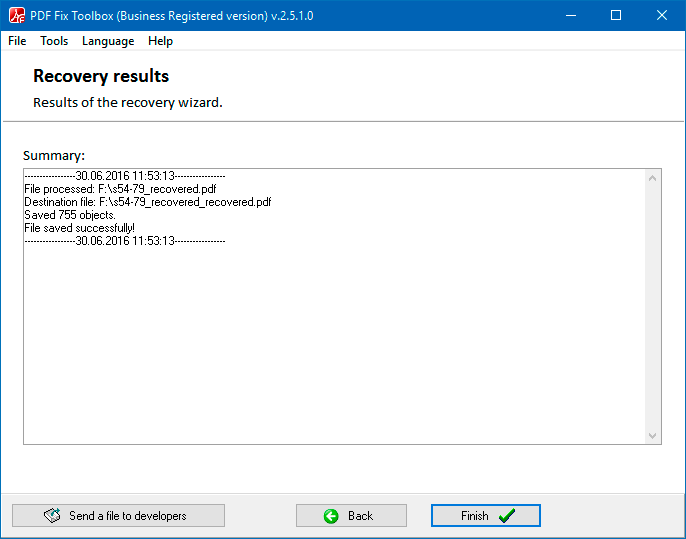 The damaged pdf fix software features a simple, step-by-step recovery master, allowing you to recover damaged files quickly and without difficulty. The damaged pdf fix program helps to fix PDF files all versions. Note: The program is not licensed under GNU General Public License (GPL) or GNU Lesser General Public License (LGPL). PDF Fix Toolbox is not open source software or a freeware tool. PDF Fix Toolbox is distributed on the try-before-you-buy basis with a free DEMO version. 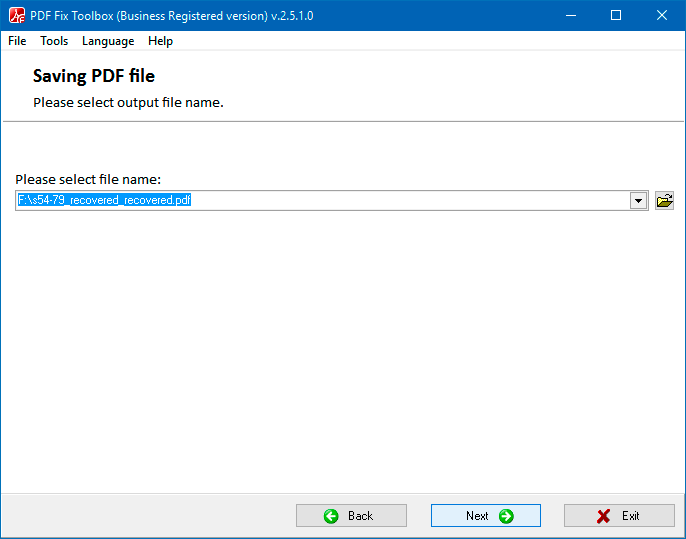 Note: PDF Fix Toolbox does not recover encrypted or password-protected *.pdf files. Selection of a damaged file to be recovered. Selection of the name of the output *.pdf file. Selection of the version of the output *.pdf file. Revision of the recovery log.